Home health health news useful woman NOW WOMEN WILL ALSO BE ABLE TO PEE THROUGH THIS INVENTION !!! NOW WOMEN WILL ALSO BE ABLE TO PEE THROUGH THIS INVENTION !!! All women have seen us in the uncomfortable situation of wanting to urinate and that it is impossible to go unnoticed by performing this action hidden behind something, just as men do. Men can pee behind a tree, a cart, in a bush, comfortably without having to expose much. Instead, women must do maneuvers to do this. And not only when it comes to urinating in the middle of the road, but urinating in a public toilet is also a daunting task, since we can not support our bodies in those dirty pots of infections, fungi and bacteria. That is why the invention created under the name of “GoGirl” is the perfect solution to this problem. 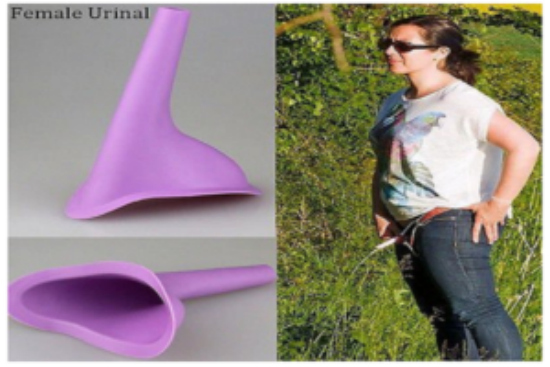 THE INVENTION THAT ALLOWS YOU TO URINATE STANDING AS A WOMAN. This apparatus is a kind of funnel made of silicone that you only have to hold so that the urine runs through it, just as men do. At the end you just have to wash this device and save it. The main idea that was created when creating this apparatus was to prevent women from having contact with public schools, as it is well known that we all do acrobatics to make our needs in these bathrooms. But this apparatus can also serve, when the emergency occurs, to urinate outdoors without any problem that we should expose ourselves, crouch, someone should cover us and everything that process normally entails. This invention, to the naked eye, is the embodiment of a very good idea. It is practical and quite useful for all women. It is easy to transfer, we can carry it in the wallet without any complication and we can use it without being indiscreet. Tell us what you think about this invention, would you use it ?, does it seem appropriate? While it seems to be the solution to many female problems in just a small silicone gizmo. Since it is only on our part to see how this new product on the market is going, it can become quite successful in its sales.